Why is MSN so popular in China? I’ve often wondered how did MSN become so popular in China all of sudden. One example to look to is Microsoft, where its MSN China site is a joint venture with Shanghai Alliance Investment, a major city investment firm run by Jiang Mianheng, son of former Chinese President Jiang Zemin. Microsoft’s China business mainly took off after that particular partnership was forged, Yu noted. Oh so long, Marianne, it’s time that we began ..
After all these planning & anxiety, we climbed nutcracker, in 5.5 hours, from 8:30am to 2pm. 5 pitches, 600 feet. It was already hot to stand in the sun. We drove passed camp 4 on our way to this picnic areas in three brothers. The camp was bustling with activity already. I was worried there might be a line up at nutcracker. There were a few cars in the parking lot, two 30ish guys were sorting through their climbing gears. We took 3.5 liters of water, 2 cans of liquid food and all the multi-gran, beef jerky, camera, headlamp, one rope, all the slings except the longest one, all the biners and all but one quick-draw, and the route map. C took his hiking books, i took my sandals. We stuffed all the water, food, and footwear into the backpack that i would be carrying. C took the slings, biners, and all the quickdraws. When we got to the bottom of the route, there were 2 backpacks by the tree. We assumed one party was ahead of us. They were on at least the 2nd pitch by then because we couldn’t see them. We put on our climbing shoes and insects repellent. The mosquitoes were still out in full force in the shade. It was “crescent shaped lieback,” “clean rock”. C was panting loudly on the top. I yelled, “Hard?” “No! Not bad at all.” But he was panting, how come? I was soon to find out. C climbed over the top of the lieback section, disappeared. I felt the full weight of 3.5L of water on my back. I had to figure out the best way to use the lieback section. Very soon I understood C’s panting. It was extremely demanding. I had to stop a few times just to catch my breath. I soon learned the trick to keep going. Stop and go was way more tasking on my arms then keep going. At the top of the crescent rock, the continuous bomber hand crack disappeared. I fumbled and fell. C got me, he yelled over “after the 2 bad hand holds is another bomber.” he was right and I was over the top and I saw him smiling down on me. He sat on a fat ledge, clipped in. We switched belay, he’s off again. 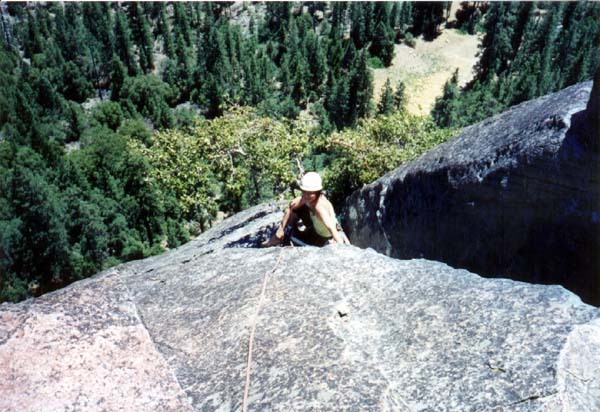 2nd pitch was the “easy walk” in the guide book. I had trouble feeding him slack fast enough. he was soon on belay. I couldn’t see him. By then I was very rested. That little bit of doubt in my mind during the 1st pitch vanished. I followed the rope up. It was a very gradual climb. I won’t call it a walk, but it’s definitely an easy climb. The 2nd belay station was on a flat rocky platform, surrounded by the grand view of the valley, very exposed, but secure and roomy. We drank our 2nd can of liquid food, took pictures of each other. C climbed on. 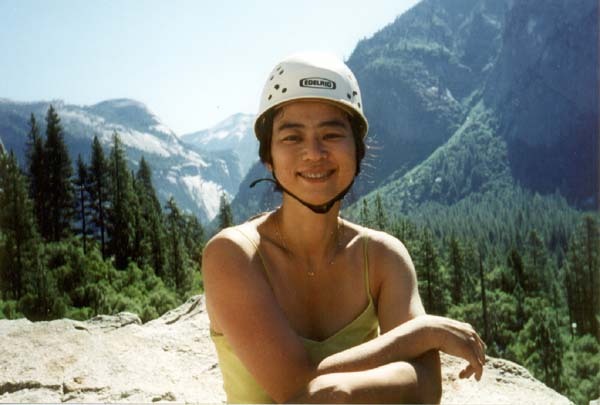 The 1st step was a super exposed horizontal move onto the rock outside of the platform, watching C leading away, his body hanging on the edge of the granite, the valley spread underneath him, and the rocky spirals standing around us, I felt grand and happy. Sidenote: we had a glimpse of the party ahead of us on the 2nd belay station. Their second was waiting for his turn. We thought we were making good speed. We also saw another party approaching when I was on the 2nd belay station belaying C, who was on the 3rd pitch. 3rd pitch was crack/face climbing. It was almost eventless, I could recall very little details. The crack was slippery. I was again tired at the top. Seeing C’s face always gave me assurance and making me more aware of my fatigue. There was a small traverse. I was begging to rest on the rope, C asked me to rest AFTER the traverse so I won’t have to weight on the next protection. It was amazing that I could always master up more strength even when I thought I was completely spent. 3rd belay station was a hanging belay, very narrow and uncomfortable. Our rope was falling away. C was off for the 4th pitch after carefully removing the waterbottle from my pack and we both drank some. Careful because we didn’t want anything to fall down 300 feet below us. While we were drinking our water, we could see the next party was at 2nd belay station right below us. They were FAST! Pretty soon the leader of the next party was up at 3rd belay station, too. he went to the left of me to set up his own belay station at the tree. They waited for us while C was up. The lead gave C some beta, that he needed to get up higher till he used up all our rope! It was the longest pitch. The rock just started burning my hand while I was on the 3rd pitch, but now there was a breeze. Under the natural sling horn, there was water sipping out of the rock as if the rock was sweating with me. My toes were slowly melting away under the black robber sole of my shoes. I couldn’t hear or see C. I felt the rope tense and then slacking off. I guessed C had to traverse and downclimb, which worried me. I thought he must be in trouble, and there was nothing I could do. After the longest time, I was getting sick of listening to the obnoxious second belittling women in general next to me, C yelled down at me to climb. I was so relieved. The 1st part was very exposed on the edge, there was hardly any hold on the smooth rock surface. I was seriously scared to death. Secretly, I was praying to God, or whoever out there cared to listen, I wasn’t being specific, please please let me get through this. I promise I won’t put myself in this situation ever again. I thought C was offroute cuz it was the kind of route in the gym that RZ would have set, tiny finger crunching holds. I was relieved when I arrived at the crux, because I was no longer exposed. I fell! The protection/rope held. The leader from the waiting party told me to try put my left foot in the crack then pull myself over. I tried three more time, fell, fell, and fell again. “You can do it.” The leader said. Slowly I inched up, my feet (forgot which one) was in the crack and I actually stood up. Holding onto the rock right above the crux, I felt so exhausted. I broke the skin of my right index finger, it’s bleeding profusely. Left some bloody finger prints on the rock. The crack was clean and solid. One good hold after another. I concentrated on one step at a time, off I went. It was a breeze. Tiring yet breezy. 4th belay station was a fat ledge. I was filled with bliss. I made it! As if from a near death experience. I remember vividly when i was traversing on that exposed ledge at the beginning of this (4th) pitch, how scared I was how I kept on reminding myself don’t look down don’t look down. Even when I was looking down to check on a foot hold, I filtered out all the peripheral vision of the valley, concentrating on the rock surface, mentally I forced myself to see nothing but the rock surface. Sitting at the belay station, the ledge felt so secure and welcoming, knowing that we were 1/5 away from the top. We happily drank up our 1st large bottle of water. “One mouthful of water” was all that I had been craving for while climbing this pitch. It felt so good when the water flowing down my sizzling throat. Sitting on the ledge, admiring the valley spread beneath us, it was like a dream. Hanging off the rock side, flying seemed such a plausible possibility right there and then. I watched C pulled off THE CRUX of the entire nutcracker. That infamous 5.8 mantle. He did it nicely. After that, all i could hear was the wind. All I could feel was the rope tensing and slacking. I couldn’t care less about the picture, or the view. I just wanted to get to the top and drink some water and not have to move. But I had no energy to argue. I got to the tree, clipped myself in, tied the backpack to the rope he fed me, he lifted the pack up. I could see Royal Arch and Half dome in the early afternoon haze, they looked lazy and shiny. At the top, C confessed he was very scared quite a few times, said it was a more sustained and demanding lead than his first lead in Arizona. He said I looked like a hermit crab when I surfaced on the last pitch, carrying that GIANT backpack (by then it had all the gears i cleaned after him, as well as his boots, my sandals, and half our water). Descend was treacherous. My sandals were not good with slippery steep hills, and the top was quite exposed and we weren’t clip in anything! I was glad we were descending in broad daylight. We rested a couple of times in the shade. Thank god we had one last bottle of water for the descend. All that heavy load finally paid off! C also said that every time when he reached a belay station, he so wanted some water but the water was with me so he had to wait. hehe. In the parking lot, we fished out the last 2 can of soda from the cooler in the trunk. It stayed cool! Was like juice from heaven. We stopped by Merced River for a dip. Icy cold water. I was happy, content, and very very tired. El Capitan was massive, sitting right in front of us. I knew I would never think of climbing that thing from now on. iPhone might not show up in china market (officially) anytime soon because “sharing revenue is not the Chinese way.” Reuters: China unlikely to see iPhone soon. Forecast has predicted chillier weather and rain on Saturday all week. Yesterday was actually sunny and relatively warm. So i was a little skeptical about the forecast. Today I woke up to a warm and cloudy morning. I decided for a run, first time since i came back from vacation. It was such a gentle and warm morning, despite the cloudy sky. It felt cozy like a comfy sweater on an autumn day. The air wrapped you around, reminded me of the title of a Fitzgerald novel “Tender is the night”, although it wasn’t the night yet. The mood was fitting. Came back from the run, i rested it a bit, talked to Gui about our plan for the day, checked out movie schedules on line, and reported to her the weather in the city “threating to rain but could go either way”. Then i went in the kitchen and made breakfast for myself, as i was sitting down to eat by the kitchen window, i suddenly realized it has started raining. The very very quiet kind of of rain, densely woven rain threads, the sky and surrounding still looked clear but moist. I could barely make out the slightly slanted rain tracks against our white painted exterior walls. Haha, we should apply this on all Chinese BBS! Could’ve saved so many wasted bits and bytes.